Going green is important and a small step in that way is to start using solar lights for your residence. Either you do it for security or to highlight some landscape details, solar lights may have a big say not only on the appearance of your home, but also on your electricity, by lowering it. Solar lights may increase the visibility and safety on your pathways, deck, yard, keeping you safe all throughout the night. As the battery recharges during the day, the solar lights should run for a whole night and its bright LED should light for even 12 hours. Most of the solar landscape lights out there are very easy to use and they automatically turn on in the evening, turning off once the morning has come. They are easy to use and to install, with no need for wiring or hardware. What makes a solar landscape light good for you? Check for your solar lights to be weather proof and waterproof, as they have to take the elements. Heat profess should be also on the list as you don’t want them to overheat. Take a look at the lumens of the lights also. The bigger the number, the brighter the light so give a thought how much you want to illuminate a specific area. As for the style, do not sweat it. The market gives you so many styles, shapes and sizes of solar lights so it’s up to you to decide which brings out the best from your landscape. 1). 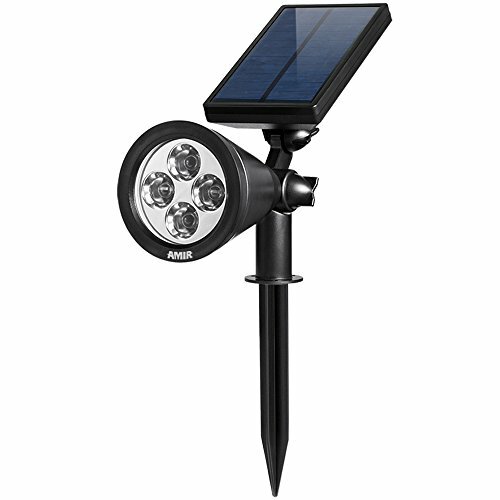 Don’t let the low price of the AMIR Upgraded 2 in 1 Solar Lights, Waterproof Outdoor Landscape Lighting Spotlight fool you as the lights manage to illuminate pretty well your landscape. The lights bring in fact plenty of good things to the table, which is why they are so popular out there. not only they present a maximum output of 200 lumens, but they also come with the level of brightness (low and high). This way, you can save even more energy, using the right mode for a specific time of the night. The build of the lights is another good thing on the list and the IP65 waterproofness grade makes the lights able to take a splash. Add the adjustability (up to 180-degrees) of the solar panel and you get to understand why the lights are such a great idea for illuminating your landscape on a low budget. Furthermore, the lights turn on automatically in the evening and turn off early in the morning. You may easily set the high/low brightness level by pressing a button from the back of the solar panel. Another thing we like on the lights is their versatility as you may wall-mount or stick them into to ground. Either way, they are so easy to install. The lights are colorful and have a sturdy build. The 1865 Li battery charges during the day for a bright light in the night. 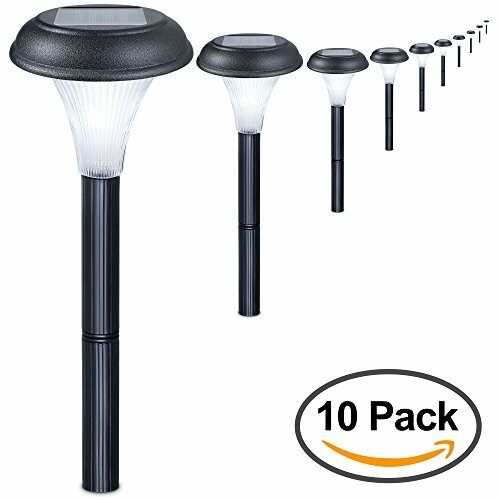 Regardless, for the low price, the lights do make it as bright, reliable, sturdy options that give a nice light to any landscape. 2). 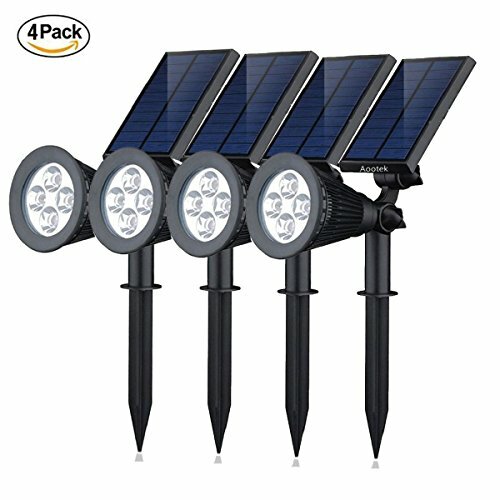 Going shopping on a fixed budget isn’t fun, but you do may get the best out of it with some lights like the Solar Lights, BlackLemon 2-in-1 Waterproof 4 LED Solar Spotlight Adjustable Wall Light Landscape Light Security. The solar powered spotlight stand out not only with their fair price, but also with their rugged build. They take all weather challenges and the rugged build makes them waterproof and heatproof at the same time. Another thing we like on the lights is their adjustability, which is fully 180 degrees. This means you may use the light where you need it and get the best angle for charging it. Additionally, the lights are automated off so give light only when you need it. The versatility of the lights is sure another good thing to add on the list and you may wall-mount or stick them into the ground- it all depends on where you need the lights. You don’t need any tools or wiring for installing the lights and the screws you need for the wall mount are included. You may also set the focus and the brightness of the lights, according to your needs. The 18650 Li-Io battery is rechargeable and efficient. It helps the lights run for even 10 hours on a full charge. Using the two level of brightness only helps you save more energy, giving a longer run for the lights. The solar panels are large and the bulbs are independent, ensuring efficiency. The lights are easy to install and give good light distribution. They are well made and even on the low setting, the light is bright. All in all, for the money you pay, the lights do remain durable, bright and dependable option to use for your landscape. 3). No matter how you want to install the InnoGear Upgraded Solar Lights 2-in-1 Waterproof Outdoor Landscape Lighting Spotlight, you sure do a good job for your landscape when using these lights. You may wall mount them or simply stick them into the ground, whatever suits you better. The lights come with the hardware you need for the wall mount and you don’t need any wiring for installing them. Not only they’re versatile, but also they’re also automatic so turn off when the evening comes and turn off automatically in the morning. Additionally, you may chose the level of brightness for a specific time, for more versatility. The built-in Li battery charges well all day long and holds a good charge. The solar panel is efficient, easy to adjust and lightweight. You may also adjust the light angle so you illuminate the best the designated area. For saving even more energy, you have to turn on the switch before using the lights. The spotlight is fairly sensitive to light and doesn’t light up in a bright area. We like the lights for their build and construction, but the brightness isn’t bad at all. The output ranges from 80 to 200 lumens so the lights are great to illuminate your landscape. The IP65 waterproof grade makes the lights safe to use even on a rainy day. Nevertheless, for the bright light, good build and versatility, the lights are able to put some landscape in the middle of attention. 4). When you’re looking for a light that warms up a bit your landscape, don’t hesitate to give it a go with the Moonrays 91754 Richmond Solar LED 25X Metal Path Warm. The lights come with white LEDs that present a 30 lumens maximum output. They include rechargeable AA NiMh battery that charges during the day and only activates lights in the evening. The battery gives 8 hours run for the lights if fully charged. The 120-dehtee wide angle means the lights cover a good area, up to 48 inches. The lights present a good build and are weatherproof, for reliable use all year long. They are made of metal and take the intense use. It’s easy to install the lights and you simply stick them into the ground, in a place that gets enough sunlight during the day. We also like the looks of the lights and their rubbed bronze finish gives a stylish vibe to any landscape. The ribbed glass lens are large and ensure maximum light output. The lights work well and are very bright. 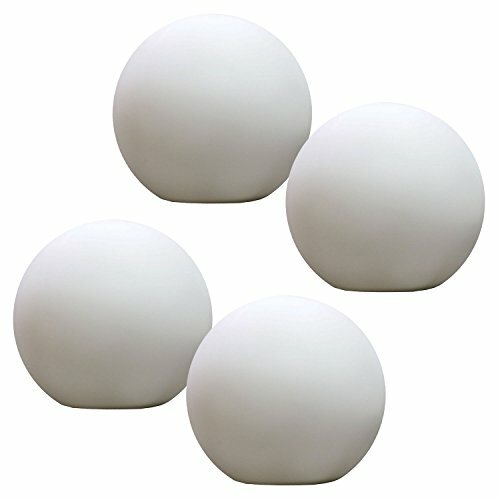 They are sturdy and bring a nice warm light over any landscape. No matter how you put it though, we still like the lights for the warm light and sturdy build. 5). 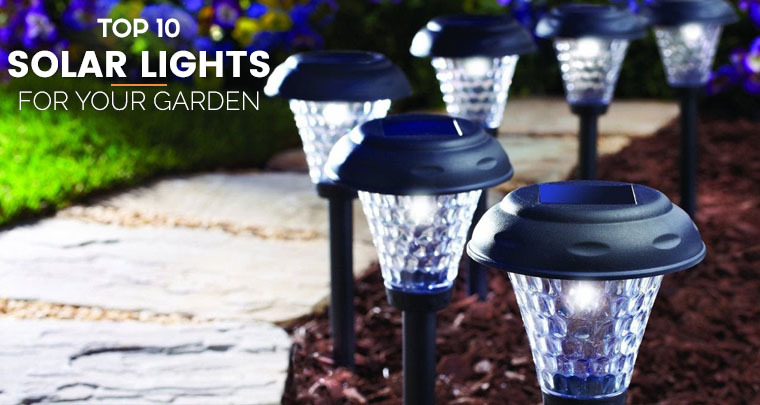 The warm light of the GardenBliss 10 Pack of Outdoor Solar Garden Lights for Your Yard Path Lawn and Landscape Lighting may be the detail that your landscape was missing until now. The lights are solar powered and charge throughout the day, ensuring 8 hours straight of running on a full charge. They come with good quality LED bulbs that have a 20,000 hours life. It’s easy to install the lights and you don’t need any wiring whatsoever. You stick the lights into the ground and enjoy the show. Furthermore, the lights automatically turn on at night and turn off the same way once the sun has come out. The construction of the lights is good and able to take a snow or a rain. The risk for overheating is minor since the lights aren’t just waterproof, but also heatproof. The lenses are made of plastic, but look nice and are so safe to use around children. The height of the lights is easy to adjust, which is great for more versatility. The lights come with two posts, for a better illumination of your landscape. The poles are darkly colored so the lights blend so much better. The lights are efficient, well made and give a warm, yet bright light. This is quite enough for many. Regardless, the lights come with many good things and make it as a good choice whenever in need to illuminate your landscape. 6). 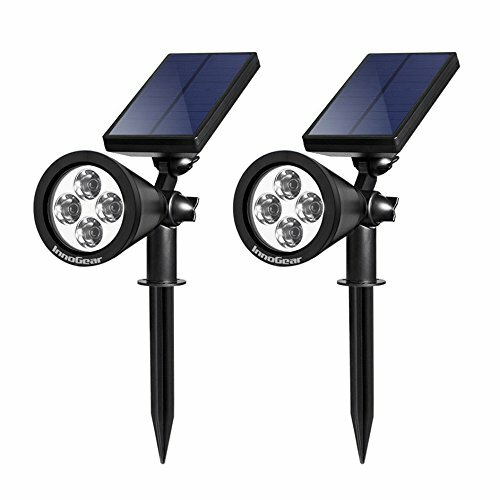 Versatile and upgraded, the Solar Spotlights, Aootek 2-in-1 Waterproof Adjustable 4 LED Wall / Landscape Solar Lights give nice bright light to any landscape. The lights present a good, sturdy build and are weatherproof. You may easily wall-mount them or inserting them into the ground, according to your needs. The solar panel is big and the monocrystalline silicone sustains higher conversion rate of energy. You do need to place the solar panel under direct sunshine for best performance. The solar panel is also fully adjustable and so is the light. You may set the light angle to illuminate better your area and adjust the solar panel angle, for best sun exposure. The lights also come with automated switch, meaning they have auto on/off features at night/morning. You may easily set the level of brightness by pressing just one button. The maximum output is 50 lumens for each LED, which gives 200 lumens in total. The built-in Li battery is rechargeable and sustain a 9 hours run for the light, when fully charged. Reliable, easy to put together and giving you bright light, the lights make it to our selections as they have so many things attached. Closing on a positive note, we like the lights for the bright light, adjustability and good build and totally get it that they’re not perfect. 7). 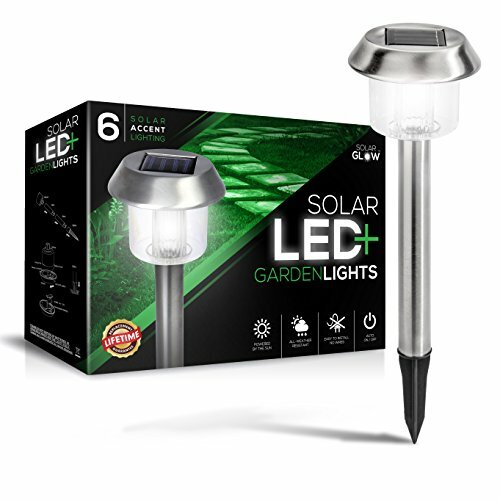 Bright, easy to install and reliable for many situations, the SolarGlow Stainless Steel LED Solar Garden Lights are very popular and we totally get it as we go through their description. The lights run entirely on solar power and are so easy to use due to their automatic operation: they turn on automatically at dusk and turn off the same way in the morning. The lights present a stainless steel design which gives them stability and longer lifespan. They are weather proof, taking rain, snow, frost and sleet rather well. We notice the tight seal, which protects them from the elements so much better. Additionally, they have a rather modern design, which is nice if your landscape needs this kind of vibe. Each light gives 15 lumens output. The batteries charge throughout the entire day and keep their charge very well. The good build, the bright light and the ease of use recommend the lights as a good option for the outdoors, not only your landscape. All in all, for the bright light and good build, the lights are definitely not to be missed on when shopping for your landscape. 8). 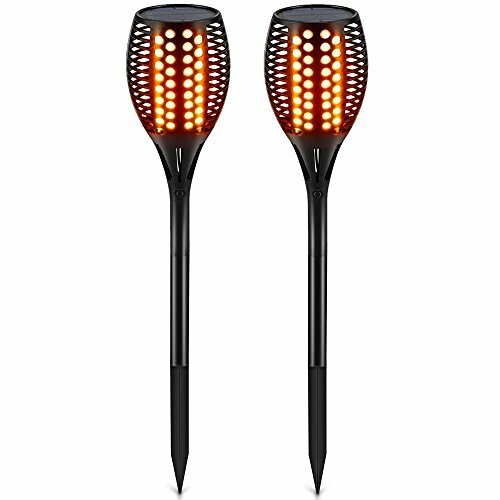 If you’re not only looking for illuminating your landscape, but also to give a dramatic feel to it, put your trust and faith in the TomCare Solar Lights, Waterproof Flickering Flames Torches Lights Outdoor. The flaming atmosphere that the lights create makes a nice impression in any landscape. The dancing flame design is natural and the LEDs give a soft, relaxing glow in your landscape. The built-in rechargeable Li-Io battery charges efficiently in the day and the lights would turn on automatically in the evening. The battery helps the light run for 10 hours, on full charge. It needs around 8 hours of charging and may even run for 5 hours in the wintertime. The flames look very real and their shape and size are so natural. The dancing effect is random and not simple at all, and you definitely don’t get any mechanical feel from the dancing. The lights are easy to put together and to install. They give a nice, amber color light and give an artistic feel to your landscape. They have a good build and are made to take the intense use. All things considered, we like the lights for all the nice shapes and dancing effect, whereas the bright amber light simply seals the deal for many. 9). 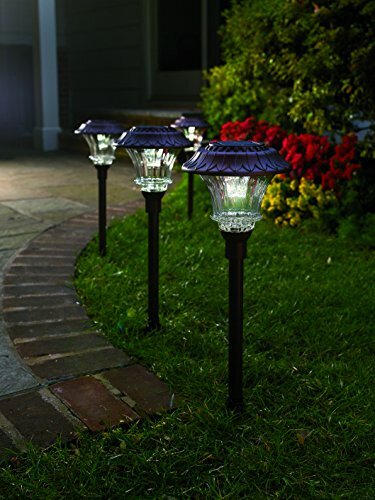 Step up your game and put your money at stake with the Set of 4 Solar Garden Path Lights, Glass and Powder Coated Cast Aluminum Metal. You may feel you pay the extra buck, but you do get instead more durability and reliable performance, no matter how worse the weather gets. Each solar light comes with 6 very bright white LEDs that ensure a clear, bright illumination. The solar panels are extra-large and sustain a 10 hours run, on full charge. The build of the lights is impressive and the body is made with powder-coated, die-cast aluminum. Even more, the lights handle the elements pretty well and hammering into a dry soil. The lens matches the sturdy build of the lights and it’s tier ripple glass lens that maximizes illumination. The glass is thick and seems to be able to take a fall. The tough build doesn’t ruin the design. By all means, the lights look nice and add an elegance feel to any landscape. Going farther with the details, we have to mention the easy installation that requires no wires whatsoever. Additionally, it’s very easy to put together the lights as well. The automatic operation of the lights means they would turn on automatically when the sun sets down and turn off when morning is coming. The 50 lumens output for each light explains why the light is so bright. The poles are tough and long, giving stability to the lights. The heavy-duty build, the bright light and reliability of the lights make them feel like they’re totally worthy every single penny. Long story short, for the tough build, bright light and high quality materials, the lights make a great investment for anyone. 10). 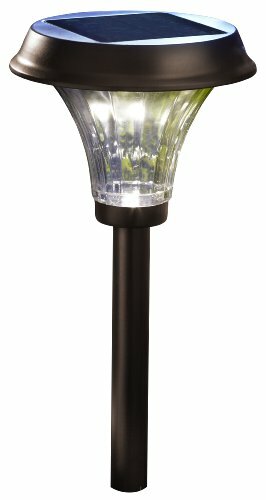 Create a romantic feel to your landscape and use some GAME 9015-04 GalaxyGLO Large Solar-Powered Waterproof 5 Color Changing Globe with Remote. Even though they may not be the typical lights for a landscape, the lights sure are able to illuminate it and to add such a nice, flowy feel to your landscape. You may also use them on your swimming pool, as they are waterproof. The solar-powered lights charge during the day and may run up until the morning. They present 5 color-changing modes and it’s easy to go through the colors using the remote control. The lights are independent so you may set different colors for each of the lights. The 5 modes let you have a special vibe every night: classic white, solid red, blue, green, and auto color changing. The lights have a good build and the satin white finish blow molded material ensures longer lifespan and pretty appearance. They are heavy enough to present good stability and to take winds up to 35 mile per hour. The LEDs are bright and the lights work no matter where you place them. Let’s not forget to mention the lights come with UV resistant coating, which explains even more their durability. The lights look nice and have a good build, giving a romantic feel to any area. For the romantic feel, good build and versatility, the lights are an interesting choice for any landscape.